Sometimes you can't avoid having a really long list of attributes in your survey. You need to understand the relative importance of different attributes in consumer decision making. Rather than have respondents rate each attribute separately, causing respondent fatigue and thus affecting the quality of your data, you can use Max Diff. 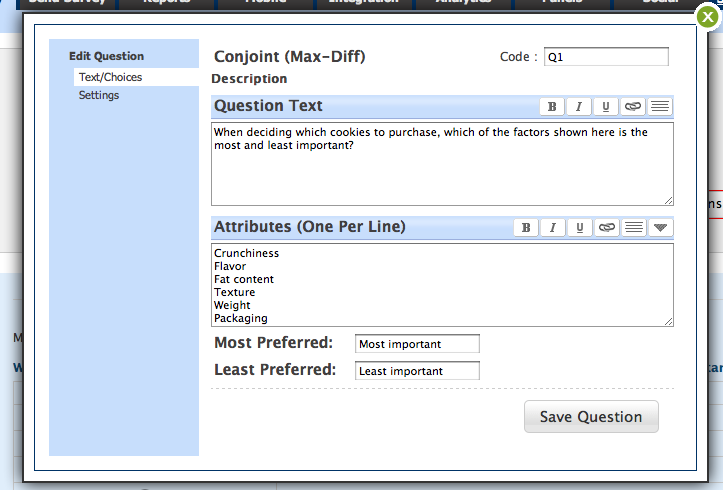 In Max Diff questions, respondents are only asked to pick the attributes which are most and least important. Yet in many ways the data produced are more revealing than data from a traditional grid of attribute ratings. Here's a brief tutorial video showing you how to set up Max-Diff in Survey Analytics' Enterprise Research Platform. If you like this tutorial video, consider subscribing to Survey Analytics' new YouTube channel for more how-to videos.